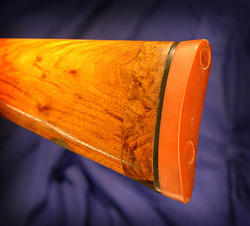 This gun is having a miss match of an older extension made up of a walnut spacing piece with a patched repair toward the toe, and a worn recoil pad, replaced by one piece extension in French Walnut. 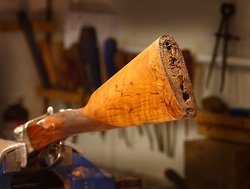 First the old recoil pad is removed, then the walnut spacer is sawn off. 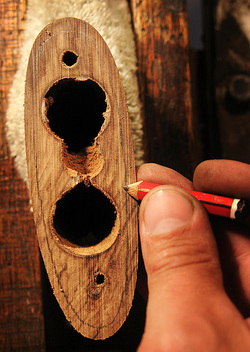 Some rough holes had been drilled in the old spacing piece to lighten it. I prefer to cut a tidy recess on the small milling machine personally. The end of the stock has been prepared on the linishing machine, and now I mark it and relieve the centre so that I can get a closer fit on the outer edge joint. This used to be done with chisels, but now I find a small hand held router to be quicker and it makes a tidier job. Now the stock is compared to our available wood selection to find the closest match. This piece happens to be a full sized stock blank. It is a good match, and there will still be plenty left on this blank to make a full sized stock. A suitable block has been cut and prepared. 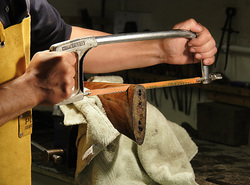 The original stock and the new block are aligned so that the grain will closely match once the new block has been shaped. The end of the original stock is prepared, centre recess cut, and outer edge smoothed for initial fit. 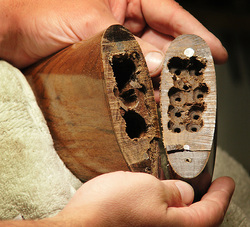 The extension piece is bored to take the locating dowels and offered up to the stock. 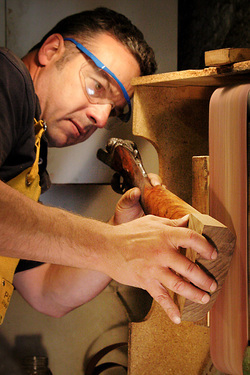 The extension is ground down on the linisher to match the profile of the stock, and the outer edge joint finely adjusted by hand. I want the closest fit I can get to keep the visible adhesive line too a minimum. Some people prefer to use just screws for to hold the extension on, but as the two woods expand and contract due to varying humidty levels the join line can become more obvious. I find bonding them together reduces the tendancy for this to show. 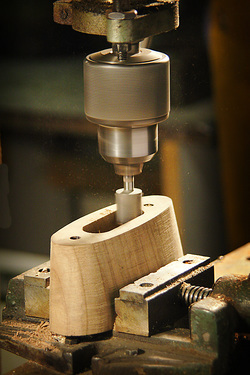 The new extension piece is machined to lighten it on our smaller milling machine. Then the extension piece is clamped in position while the adhesive bonds it to the original stock. The finished job, oil finished and chequered. Now I think that looks a lot better.